Restorative Radio: Audio Postcards share the sounds, voices and music of home with those incarcerated far away. 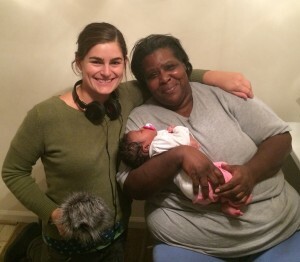 Producer Sylvia Ryerson worked with family members of those incarcerated in two supermax prisons in far southwest Virginia to create long-form radio pieces to send out to their loved ones in prison over the airwaves. Michelle borrowed an audio recorder and spent three months recording her own life, to share with William over the airwaves of WMMT-FM. You can hear her full piece here. Ryerson worked with people interested in their pieces airing publicly. Each piece is created for one person in particular, but also intended to reach a general audience – making visible the humanity of people behind bars, and the experience of family members with loved ones incarcerated far from home. 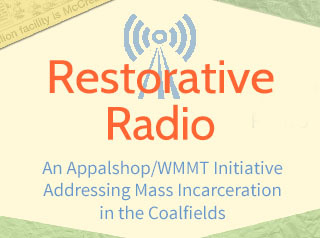 Each audio postcard has aired (and is continuing to air) on WMMT-FM, and has been heard by the intended recipient in prison. To hear the hour-long episodes broadcast on WMMT-FM of this series, click here. Ultimately this project imagines communication that transcends prison walls, creating a pathway towards healing for individuals, families, communities and a nation profoundly affected by mass incarceration. Rather than documenting the barriers to staying connected, each audio postcard enacts meaningful communication in spite of and in response to such barriers, in a collaborative process. By working with people willing for their pieces to air publicly, these personal audio postcards aim to spark public dialogue on the very kinds of human intimacy and connection our prison system makes extraordinarily difficult. The one-way conversation inherent in each piece, marked by the absence of a response from the incarcerated recipient, evidences the human experience of geographic separation, censorship, solitary confinement and other realities within our prison system. Every week, these families continue to call into the weekly Calls from Home radio show. To help keep this radio show going – allowing families to send a message to their loved one in prison at no cost – please click the donate button below.